I was ready to review White Smoke in Azabu Juban, because I’d heard the BBQ is magical and authentic and will touch your soul in deep and meaningful ways. 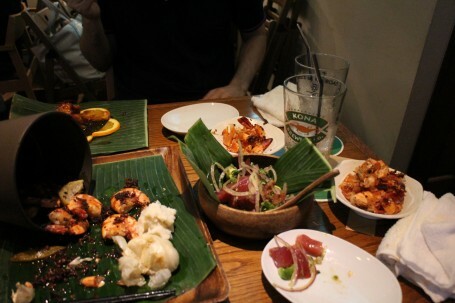 So I grabbed Anthony Joh, and we headed to Azabu to eat sticky stuff with our hands. You can imagine how sad we were when we learned White Smoke is under renovation until the end of the month, but their online booking system is still letting people book tables with no email stating the restaurant is actually CLOSED (nice). So to compensate, we headed over to Kai to drown our sorrows in shrimp. Casual, surfy Hawaiian-style yakitori. Surf films play on the wall while you count the SPAM tins lining the open kitchen window. 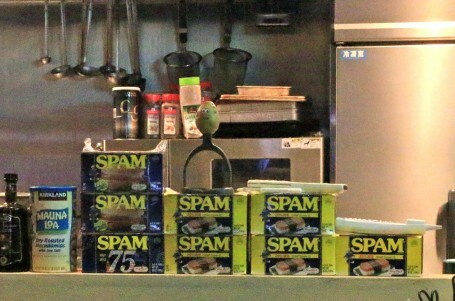 I know Hawaii is the biggest consumer of SPAM, but going from amazing slow cooked BBQ to SPAM rolls was too much for my little heart to handle (not to mention Anthony was totally grossed out), so we opted to play it safe and try the dishes the place is known for. 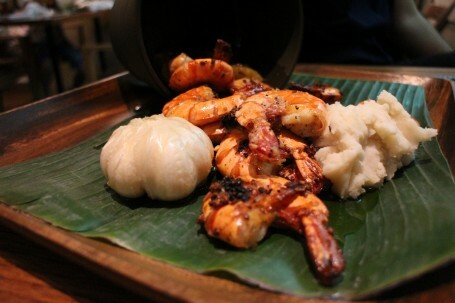 Garlic Shrimp: Peel and eat– the House specialty. Sweet, fresh, and perfectly prepared. They have three different head counts and the medium is more than enough for two people. They’re served with a full head of slow roasted garlic and mashed potatoes, which weren’t hot, but still pretty tasty. And, as a rule, I like all of my food served on banana leaves. Hawaiian-style Poke: We both agreed–this was the stand out dish. Ruby red, superfresh tuna, chopped with creamy avocado and razor-thin red onion. The sesame dressing was light and not cloying even a little bit. Honestly–we should have cut the shrimp order in half and ordered two of these. I could eat this every day. Orange Chicken: It’s fried chicken covered in sweet, tangy awesome sauce. What’s not to like? Kai’s version is especially light on breading so you don’t feel like you just ate a Buick when you’re done. Other stuff: Aside from the usual yakitori suspects, other menu items include SPAM rolls, Hawaiian-style pork, and a gorgeous organic stick salad with miso dip. They have some incongruous choices like camembert and chicken (really? surf food?) but the house recommendations were all really tasty. Kai’s probably isn’t my first choice for a date night: it was a little loud the night we went, and the garlic shrimp left me radiating the next day (but to be fair, that’s really my fault now isn’t it?). But it’s just down Azabu from White Smoke and definitely worth checking out with wave-hunting friends.